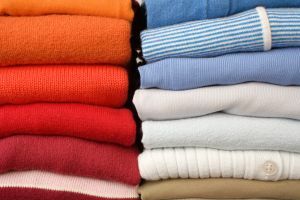 Now that it’s time to bring your warm weather clothes out again, it’s also the perfect time to reorganize your closet. Don’t fall into the trap of just straightening up and then winding up with the same old mess in a couple of weeks. These easy tips will help you get what you really need out of your closet reorganization – a workable, everyday system that stays neat easily. Are you going to wear that? The best favor you can do for yourself is being realistic about how much you actually need to store in your closet. First, go through and find anything you haven’t worn in over a year. If something’s just hanging there taking up valuable closet real estate, it should earn that place. Still not sure whether you want to get rid of some items? Mark the hangers of those items, only remove the markers once you’ve worn them and if they STILL don’t get used, you’ll have a final answer on whether you should keep them or not. How long does it take you to find the right shoes in the morning? If you’ve been keeping everything in the boxes they came in, do yourself a favor and streamline things by either labeling the boxes or, even better, getting stackable clear shoe boxes with sliding drawers. These provide easy access and a sneak peek at your options. Divide & conquer! Sometimes the key to getting an organized closet is your sorting system. Some people prefer to sort by color, others sort by complete outfit. Another approach is dividing casual wear, work wear and formal items into their own sections. See which approach suits you and your morning routine and your closet should get a lot more organized. Do you plan on buying closet organizing supplies? Believe me when I tell you that you will get to the closet organization aisle at Lowes and be overwhelmed by the choices. Before you go you need to make a list of what you want to hang up, box or store for next season. You might want to take some measurements of your closet’s depth, width and height, too. Then, once you’re in the store, you’ll be able to figure out exactly what will meet your needs.